Successfully Added Aosder Portable Bluetooth Speaker - DSP Sound Processing Chip, Stunning LED Effects, Built-in Mic, 3600mAh, EQ Adjustment to your Shopping Cart. With this portable Bluetooth speaker from Aosder you will be able to add a stunning visual aspect to your audio experience. Featuring 88 bright LEDs, this wireless stereo speaker portraits beautiful colors while you are listening to all your favorite tracks. Featuring a compact size and light weight design this wireless Bluetooth speaker can be easily carried around, allowing you to listen and share your music where ever you are. With its durable design the Aosder LED Bluetooth speaker is suitable for outside usage while, at the same time, its stylish looks and LED visuals make it a perfect electronic accessory that would form a true asset to any modern household. Featuring the latest sound technology this colorful Bluetooth speaker truly delivers a mesmerizing audio experience, fit for any audiophile out there. Whether you’re out for a picnic in the park or are simply enjoying your favorite tracks at home – with this wireless speaker you will be guaranteed to treat yourself and your surroundings with stunningly smooth and beautiful audio. Added to that come the speaker’s 88 three-color LED lights that display breathtaking 360 degree visuals, ensured to grab the attention of everybody in the room. Featuring 6 different LED light pulsation modes the Aosder wireless speaker is there to create the perfect atmosphere for any imaginable moment. 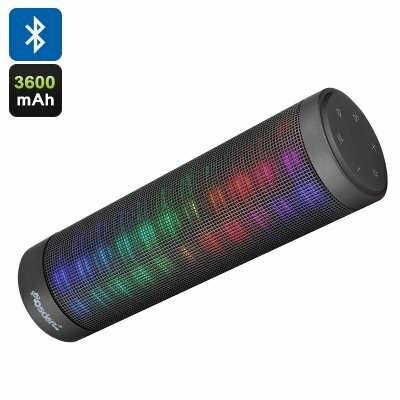 Packing a built-in 36000mAh rechargeable lithium-ion battery this Bluetooth 4.0 speaker lets you enjoy your music for 10 hours continuously. When not in use this magnificent audio player has a stunning standby time of 1 month meaning that whenever you come back from an upcoming holiday your Bluetooth speaker will be waiting for you, ready to play some tunes. Reaching volumes of up to 75dB you will be able to listen to all your songs in great quality without being interrupted by outside noise. Additionally, this wireless speaker features a 3.5mm Audio Jack – allowing you to listen to music without disturbing your surroundings. Coming with a built-in microphone this Bluetooth 4.0 speaker does not only allow you to listen to music but also lets you make hands-free phone calls at any moment. No longer will there be the need to dig through your bag and search for your smartphone when you receive an important call. Simply pair this speaker to your cell phone and from now on you’ll be able efficiently to answer any call without the need to physically touch your smartphone. Thanks to its professional DSP sound processing chip and EQ adjustment this speaker delivers the perfect sound for any occasion. Whether you listen smooth Jazz, rap, Rock & Roll, or simply make a phone call – with the Aosder LED speaker you can be assured to enjoy the highest possible sound quality. This portable Bluetooth speaker comes with a 12 months warranty, brought to you by the leader in wireless speakers as well as wholesale electronic gadgets..